A Feb. 2010 investigation by Truth Wins Out (TWO) and South Florida Gay News (SFGN), with assistance from Virginia attorney Mike Hamar, revealed that JONAH co-founder, Arthur Abba Goldberg, was a Wall Street criminal mastermind who was convicted in 1987 of “fraud of spectacular scope” had secretly reinvented himself as a moral leader who “cures” gay and lesbian people. 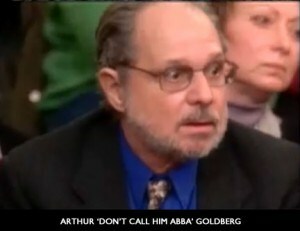 Known as “Abba Dabba Do” in the financial world, Arthur Abba Goldberg was sentenced to 18 months in jail for bilking poor communities with complicated bond schemes and served six months in prison. When we broke the story, it was incredibly difficult to get the mainstream media to bite. Thankfully, we had the LGBT blogosphere — Joe Jervis, Pam Spaulding, Andy Towle, Jeremy Hooper and Ex-Gay Watch — to spread the word. When we exposed Abba Goldberg, it became clear that he had not revealed his criminal past to the National Association for Research and Therapy of Homosexuality (NARTH), where he was an officer. This resulted in his resignation. Mr. Goldberg helped found Jonah in 1999, after he finished serving a prison sentence and probation for financial fraud he committed in the 1980s. Abba Goldberg’s past as a con artist was mentioned again on CNN on Saturday by one of the plaintiffs in the SPLC lawsuit. The popular progressive website Daily Kos wrote an article, Arthur Goldberg, founder of conversion therapy outfit, bilked cities out of millions, which discussed Goldberg’s criminal past in great detail. The author of the article, who goes by the name Christian Dem in NC, followed up with a second piece, Why is the religious right defending an unrepentant con man who preyed on minority communities?. But when you look further into it, you really have to wonder why the fundies are mounting a full-throated defense of JONAH. After all, back in the 1980s its founder, Arthur Goldberg, was the mastermind of one of the largest investment frauds uncovered during the 1980s. From 1984 to 1986, Goldberg and his firm, Matthews & Wright, convinced several cities to buy $2 billion worth of fraudulent municipal bonds. If that wasn’t bad enough, all indications were that he deliberately targeted impoverished communities with large minority populations. For instance, he got East St. Louis, Illinois–a city that at the time had almost half of its residents out of work–to raise $223 million for a riverfront housing development. He also got Guam to raise $300 million for single-family housing. Facing over 60 counts of fraud in Guam and Illinois (though the Guamanian case had to be moved to Los Angeles because so many of that island’s residents had been bilked), Goldberg pleaded guilty to charges of mail fraud and conspiracy to defraud in 1989 and was sentenced to 18 months in prison. All indications are that Abba Goldberg is a sleaze merchant who doesn’t have a do right mind. When he was finished with probation his life was in sham bles. He was barred from working on Wall Street and disbarred as an attorney. Quite frankly, he needed a way to earn a living (aka bilk people) and keep himself occupied. So, he dropped his easily identifiable (and easily Googled) middle name and began his life over as Arthur Goldberg. With thousands of men with the common name Arthur Goldbergs, he could begin his life over in relative anonymity and conceal his jailbird past. It is gratifying to know that we played a role in revealing the truth about Arthur Abba Goldberg — and it is satisfying to finally see this man’s past revealed in the mainstream media. It might have taken two frustrating years, but it finally happened! The name of this organization is Truth Wins Out, which is aspirational, since lies and chicanery often seem to come out on the winning end. However, what we promise is to keep fighting so justice can prevail as often as possible. Seeing Arthur Abba Goldberg’s name publicly tied to his unethical criminal past — it is a small example of truth overcoming deceit. An example, nonetheless that will keep people out of his phony program and help save people from pain and humiliation. 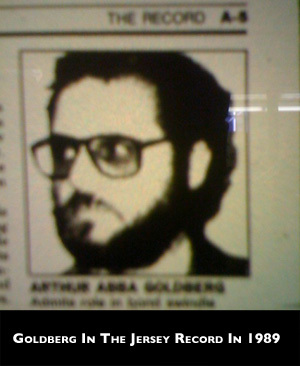 If you are a blogger or have a Facebook account, please spread the word about the real identity of Arthur Abba Goldberg. No one should believe that JONAH is a reputable organization run by a paragon of virtue — as Abba Goldberg often falsely presents himself.